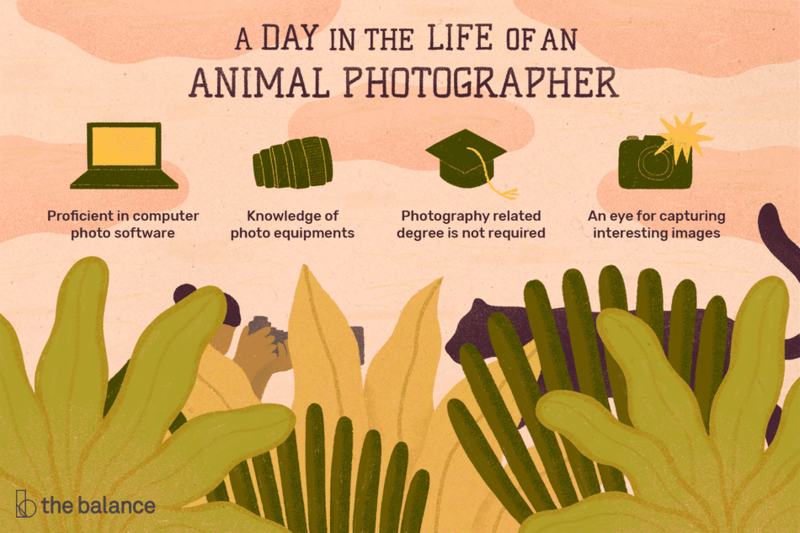 What Does an Animal Photographer Do? Animal photographers capture images of animals for use in commercial and artistic endeavors. They must have an eye for capturing balanced, interesting images of their animal subjects. They must also have knowledge of how to use various lenses, flashes, and other equipment to compensate for lighting conditions, weather conditions, and animal movement. Animal photographers can specialize by photographing one specific species or a category of animals such as wildlife, horses, or pets. There may be further specialization as a photographer finds a particular niche in their area of the industry. For example, an equine photographer might specialize in show, racing, conformation, or stallion photography. Pet photographers generally work directly for owners at their request. They may work in a studio or visit clients in a convenient photo shoot location, such as their home or a local park. Some animal photographers focus on supplying images to stock photo agencies. The photographer earns a commission when the stock agency licenses a client to use the image for a fee. Photographers may also choose to bypass stock agencies entirely and sell their own pictures directly for use in advertisements, magazines, or websites. Education: No degree is required to become an animal photographer, but many successful photographers hold a college degree in photography or photojournalism. It is also entirely possible to major in an unrelated area and includes some photography classes as part of the educational experience. Training and experience: The most important thing for aspiring photographers is to gain training experience from those who are experienced in the art of photography, whether this comes from taking formal classes or an apprenticeship with a mentor. Photography is a very technical art, and there are many items of equipment that must be mastered, not to mention the considerations that go into capturing the right shot of an animal that may or may not be a cooperative subject. Many communities have groups or clubs for photographers. These clubs can connect aspiring photographers and seasoned professionals, as well as provide a forum for discussing new techniques and emerging technology in the field. Artistic skills: Animal photographers must have an eye for capturing balanced, interesting images of their animal subjects. Technical skills: Most photographers use specialized computer photo software to crop and manipulate images, so computer and technology skills are generally of high value. Interpersonal skills: Animal photographers must listen to and work well with their clients or employers to capture the images they want and need. The BLS projects that employment in the general field of photography will decline 6 percent through 2026. Animal photography will continue to be an accessible career option for freelancers, though there will be keen competition for salaried full-time positions. Most photographers need to stand or walk for long periods while taking photos. Some animal photographers, especially those involved in wildlife photography, work in the field and travel across the globe in pursuit of their animal subjects. Others, especially pet photographers, maintain a studio location or take photos in a single city or region. The work schedule of animal photographers often depends on whether they work for themselves, as freelancers, or for companies. Often, their hours are flexible—especially if they're working as freelancers. Some people choose to pursue photography part-time while holding a full-time position in another industry. Three in 10 photographers work part time, according to the BLS. A good mentor will help you build your animal photography skills and relationships with others in the field. Creating and maintaining a digital portfolio of your photography will show potential employers what you can do. Many animal rescue organizations need volunteer photographers to take pictures of their adoptable pets. Taking such an opportunity can help you gain experience and build your portfolio. What Is a Pet Adoption Counselor?